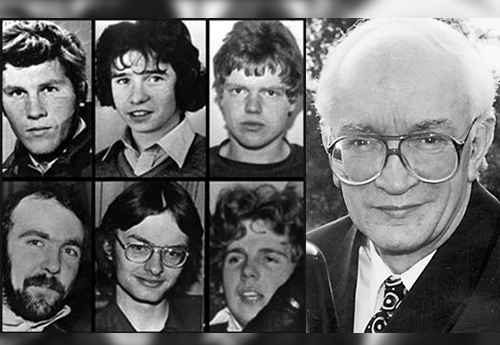 Top secret files relating to the killing of nine men in Co Armagh more than 30 years ago were destroyed by the British government just weeks before an inquest into the deaths was due to begin, The Detail can reveal. In the mid 1980s two senior British police detectives, John Stalker and Colin Sampson, were each asked to investigate a series of incidents which resulted in the killing of three RUC officers and weeks later six unarmed nationalists. RUC officers Sean Quinn, Alan McCloy and Paul Hamilton were killed by an IRA landmine near Lurgan in October 1982. Within weeks Gervaise McKerr, Sean Burns, Eugene Toman, Seamus Grew, Roddy Carroll and 17 year-old Michael Tighe were all shot dead by the RUC’s Special Support Unit (SSU) in a series of controversial shootings in Co Armagh. All but Michael Tighe were members of republican paramilitary organisations; however none were armed at the time they were killed. The incidents became known as the ‘Shoot to Kill’ deaths after one of the RUC officers involved admitted that official claims that the men had been killed after driving through security force checkpoints were untrue. In 1984 then Greater Manchester Deputy Chief Constable John Stalker began to investigate the killings. Weeks before he was due to publish his report in 1986 he was removed from the investigation and replaced by Colin Sampson. Despite a 30 year campaign by the families of those killed for an inquest into the deaths, the Stalker/Sampson reports have never been made public. The files compiled by Stalker and Sampson are understood to be crucial to the inquest’s ability to investigate the events surrounding the killings. Northern Ireland Senior Coroner John Leckey had hoped to open an inquest into the deaths in April 2013. However The Detail has now obtained official government correspondence confirming that Stalker/Sampson files were destroyed last February, just weeks before the inquest was due to open. The Cornoners’ Office was not informed until July of this year that the files had been destroyed. The correspondence does not make it clear how many files relating to Stalker/Sampson were destroyed or which government departments, which include the Ministry of Defence and MI5, may have been responsible for the destruction of the files. The Treasury is responsible for providing legal advice to all government departments in England and Wales. In a letter to the Northern Ireland Coroner’s Office on 7 July this year, in his role as senior legal adviser the Treasury’s Permanent Secretary Sir Nicholas MacPherson, advised that in 2013 his department had undertaken a review to transfer records it held to the National Archive. Sir Nicholas wrote: “As part of this review, in February 2013 a number of file series were destroyed whilst others were preserved. “The Senior Coroner is concerned to learn that as part of the review carried out by your department last year, files relating to the Stalker/Sampson series of inquests were destroyed. The Coroner’s Office has now requested disclosure of all the relevant paperwork relating to who was involved in the decision to destroy the Stalker/Sampson files. Mr Leckey’s legal representatives have also written to the Crown’s Solicitor’s Office, which provides legal advice on Northern Ireland issues to all government departments in Whitehall, to ask if other files relating to the ‘Shoot to Kill’ inquests have also been destroyed and to instruct that any remaining files should now be safely retained for disclosure to the inquest. The letter states: “In order that we may be apprised of any wider or additional destruction of files relating to these inquests, can you please take instructions from the departments and agencies for whom you act, as to whether any such files have been destroyed. News that Stalker/Sampson files have been destroyed comes as newly appointed Deputy Chief Constable Drew Harris is due to appear before Senior Coroner John Leckey on Monday to explain the PSNI delays in disclosing relevant intelligence material to the court. Earlier this summer The Detail revealed correspondence in which Mr Leckey warned that the inquests may not be able to proceed if there is insufficient disclosure of state files. The Senior Coroner warned the British government that a continuing failure to adequately resource inquests into historic Troubles killings could leave it in breach of international law.